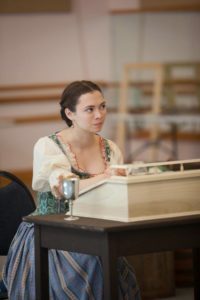 Elise Collins as Judith in Equivocation at the Colorado Shakespeare Festival. After college, I would like to perform theatre professionally and utilize theatre to create social change. I would like to start a theatre group that tells the stories of underrepresented groups and utilizes interactive methods to discuss social justice topics through performance. I hope to hold the mirror up to nature and provide audiences with the opportunity to rehearse how they would deal with various subjects in real life. In college I have been part of the Interactive Theatre Project, the Presidents Leadership Class, CU OnStage, salsa, blues and swing. The Interactive Theatre Project is a group that utilizes techniques from Augusto Boal’s Theatre of the Oppressed to start dialogues about complex social issues and create positive social change. I joined this organization because I am passionate about social justice and theatre. The President’s Leadership Class has been a wonderful opportunity to study leadership, both in the classroom and in the real world. I have been president and secretary for CU OnStage, an organization that creates performance opportunities for students by organizing the annual CU Fringe Festival, a weekend full of free student performance art. I wanted to give students an opportunity to pursue their passion in an environment where it was safe to take risks and fail. I enjoy dancing salsa, blues and swing because it gives me a chance to listen to good music, move freely and spend time with friends. Angela Thieman Dino, my professor for multi-level issues in leadership, greatly influenced the way that I lead and approach new challenges. She helped me learn how to approach challenges from a mindset of abundance rather than a mindset of scarcity. Her guidance has taught me how to research, given me the tools to become an expert on any subject within a month and showed me how to view every concept through a variety of lenses – an individual lens, an interpersonal lens and an institutional lens. She has given me confidence, perspective and the courage to create positive social change. I received the best advice in the form of a phrase from a director’s pre-show ritual. Before every show, the entire cast would recite the following phrase “Grant me the serenity to accept the things I cannot change, the courage to change the things I can and the wisdom to know the difference.” This quote always gives me perspective and strength in times of stress. It has shaped the way that I view the world and overcome obstacles in my life. I would like to have dinner with William Shakespeare, Gandhi, Eleanor Roosevelt and Rosalind Franklin. I would ask Shakespeare about his writing process and the details about his life, ask Gandhi about his leadership style and finding a worthwhile cause to pursue, ask Eleanor Roosevelt for social activism advice and ask Rosalind Franklin about how she maintained such an incredible work ethic and overcame adversity within the male-dominated scientific community.